ColorED Edition TME Double Module building. 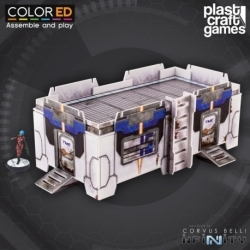 This pre-colored scenery element is designed for Infinity and can be used with any other futuristic aesthetic 25-28mm scale game. TME - Double Module building is compatible with the rest of TME scenery elements giving the chance of building many different terrain configurations. The Double Module comes in a pack that includes a set of individual pre-colored pieces. Some of the pieces come in a PVC sheet and you will need to cut the connections that fix them to the PVC sheet. Assemble the different parts by following the assembly instructions that can be found on this link: Assembly Instructions using cyanocrylate glue or a similar one.